St. Ambrose (c.340-397), bishop of Milan, was one of the most important early Christian writers. His preaching was also extremely popular and persuasive--so much so, that mothers might prevent daughters from listening to his teachings extolling virginity. The present manuscript was owned in the Middle Ages by Battle Abbey, in Sussex. The volume opens with an initial with typical 'Channel style' features (so called because the style was practised on both sides of the English Channel, and it can be difficult to distinguish between English and French examples): tight coils of vegetation, with lush acanthus terminals, a gold ground, groups of triple white dots, and an outer edging of green. 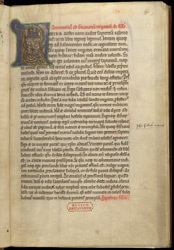 Towards the top right-hand corner of the page are the letters 'CO' in red: the typical form of Battle Abbey press-mark.